This is one of my all time favorite books. It's a touching story of how a grandfather tells his granddaughter all about the story of her name. It's not only a great story of self acceptance, but a beautiful piece of multicultural literature as well. After reading the book, I have my students complete a homework assignment where they ask their parents some questions about their name. Then we review the structure of an informational paragraph, and my kiddos write an informational paragraph all about their name. Once finished, we make mini versions of ourselves and hang our completed writings up outside. It makes an adorable back to school bulletin board! :) We also share them as a class, and it's a fun community building activity and a great way to teach and model author's chair/writing sharing procedures. 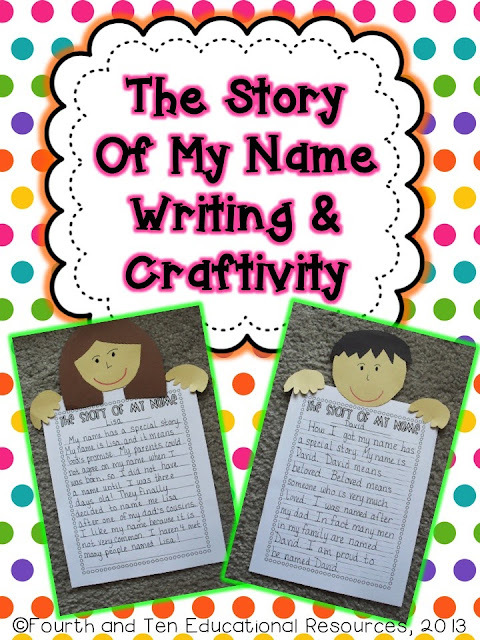 If you'd like to check out my Story of My Name Writing and Craftivity pack, click on the images above or here to check it out on TpT! :) If you already download this file, you can redownload the new and improved version for free! What about you, does your name have a special story? I purchased this last year and my students really enjoyed completing the project! This was such a great beginning of the year activity. I loved learning about my students' names last year. I will definitely be downloading the update and using it this year. I love this idea. 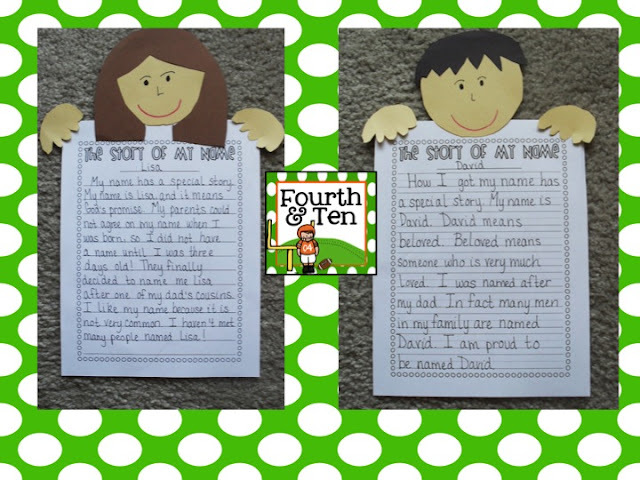 It's a great way to learn about the students, as well as for the students to learn about themselves. I have the product on my wish list now. I will likely buy it when I make my back to school purchase. Thank you for sharing. I love your blog by the way. I am a recent follower, but a long-time reader. You have shared a nice idea I really like it. I Like the way of you writing nice stuff for your shairng. If this is necessary then I will look for clash of clans cheats gems for this awesome game clash of clans. Fantastic post. I will definitely share it on my fb page. Keep it up. Very well written article. I enjoyed reading it. Thanks for share. I am really impressed by reading your blog. As your thoughts are amazing. Fantastic post. This is great work I like it. You no doubt have several authors that you particularly admire. And, as you might expect,custom writing service rate they can be helpful in developing your voice. Begin by looking carefully at the way they write. I am Appreciate the idea that you share with. The representation of your thought is interesting and i am enjoying to read it. This may be just about anything I just won’t to find discovering. I just earnestly give preference to your web blog that I appreciate the time and effort. A piece of writing is really advantageous regarding Western say not to mention quite a lot of some people to edit. Equipped toil will be able altogether bring back within your websites for the purpose of spare items. Nowadays follow this check cashing All the best . Wells Fargo is among the international leaders as well as a top auto loan provider. Wells Fargo Dealer Services With eServices, you can register for eStatements to make sure that you can download. A few moneylenders likewise offer a "moving over" alternative which infers that the credit is reached out to the following payday. This web site really has all the information Valid CAS-003 braindumps I needed concerning this subject and didn’t know who to ask. Thanks for sharing your post that was nice. We also an organization and provide approved CDR Report Format and writing services by CDR Report Writers Australia online. We also offer writing help in almost all discipline such as Mechanical, ECE, Electrical, Civil, Aeronautical, Mining and all. For further query, visit our website. Thank you so much for providing excellent and important information. Mycdraustralia.com provides CDR writing services & migration skill assessment by CDR writers online 24*7.